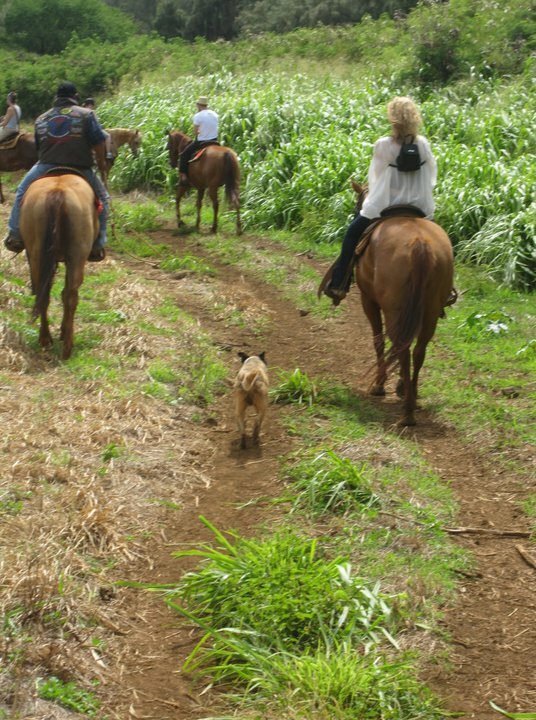 I’m going to pick up from my last post about the cowboy culture of Hawaii with my next adventure! 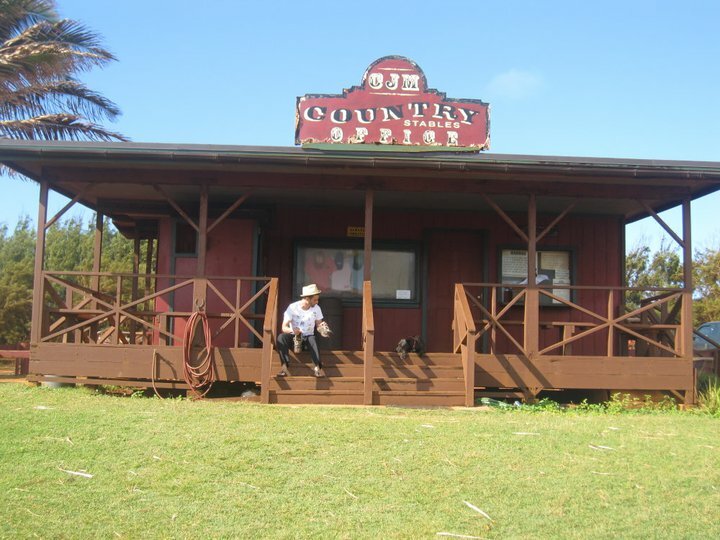 Also taking place in Kauai, this adventure was completed on the South Shore of the island in a town called Poipu. 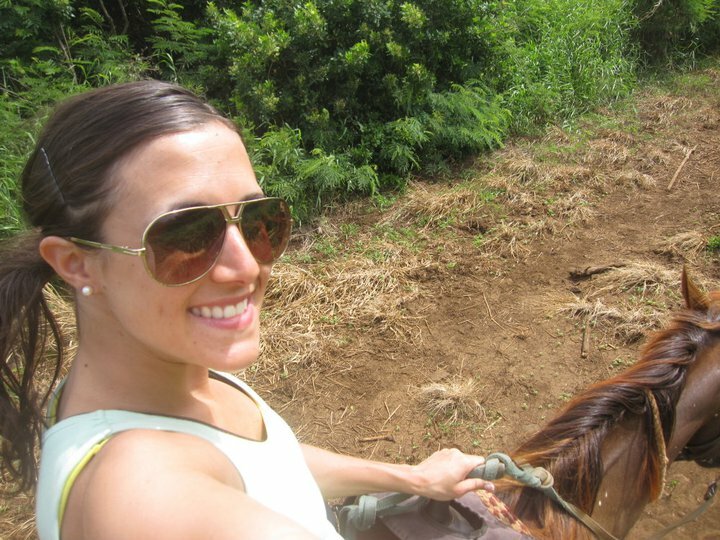 We really wanted to go for a horseback ride on our trip, and our local rodeo friend recommended that we head down to CJM Stables so that is exactly what we did. 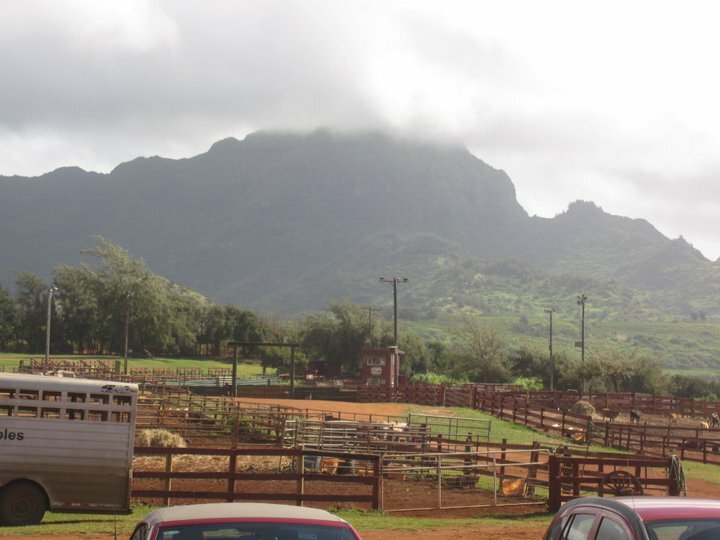 Aside from beef production, another source of income for these ranches and stables are tourists coming through for horseback rides and tours. Sorry again for being repetitive to those who took the time to read my entire Hawaii post, but I want to elaborate for those who only read the condensed version. 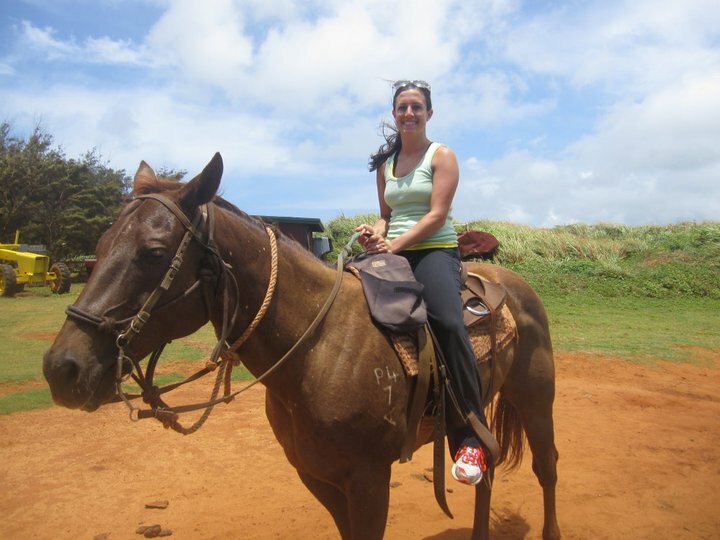 Before completing this bucket list item, I had only been on a horse twice in my life–once was on my 7th birthday when my parents threw my sister and I a carnival birthday party (still my favorite birthday party to date.) They hired the neighbor who had a stable to come up with one of her horses for “pony rides” for all the kids. We walked around the front yard a couple times with someone holding the reins from the front leading the horse around, and we called it a day. The second time, I was about 10, and once again I didn’t have full control of my horse, as we were at the stable of a family friend, and she led the horse around the ring a couple times with me on it. Upon our arrival at CJM Stables, I was really excited as this would be my first time on a horse by myself without help controlling it (which also made me a little nervous!). 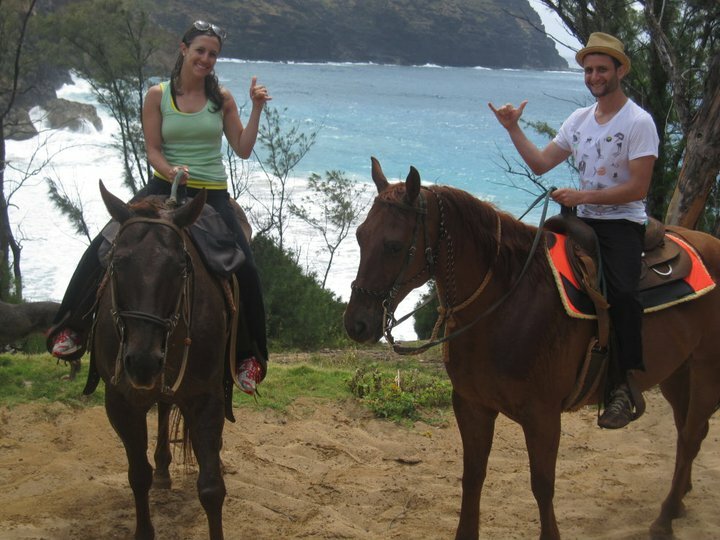 I was also really looking forward to a romantic experience of riding a horse down a trail with my new husband. The best part was that the ride took place on both the beach and the mountain side; I really don’t think you can get any better than that! My horse’s name was Hoppa, and while she listened to my commands fairly well, she was definitely a lazy one! I think it was a good match for me though, because as a beginner, I may have freaked out with a rambunctious horse. You know what happens when a horse feels your fear? That’s right–they get scared, and could consequently buck you off. Not my idea of romantic. So Zack, the fearless one, got the spunkier horse named Dude who just ate grass the whole time on the trail (you weren’t supposed to let them eat the grass by the way–I hope this isn’t how Zack plans to discipline our future children.) The ride was absolutely beautiful. 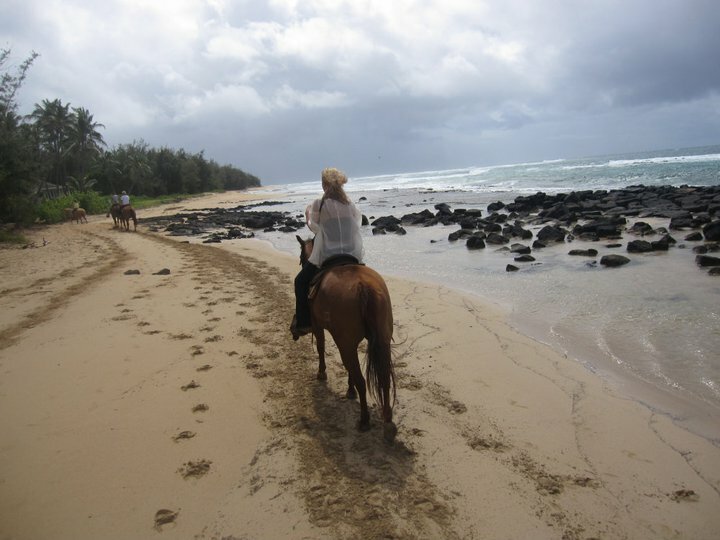 It was so amazing to be riding a horse right on the beach and then up through the mountainside. We got caught in a couple rain showers, but even that couldn’t ruin the amazing scenery and experience we were having. I picked up riding surprisingly quickly, and we had such a great time. Our guide, Chaz, was a lot of fun, and we found out that he and his partner actually won the roping competition at the Waipa Rodeo from my previous post! We took some photos which you will see below and enjoyed some delicious POG (Passion Fruit, Orange, Guava drink) on the trail. At the end of the ride, I was sad that it was over and I had to say goodbye to my horse, but my legs and bum were certainly pleased that we were finished! This is the last Hawaiian adventure I’ve completed on my bucket list to date, and I’m so grateful we were able to tick off SO many fun things while we were here! Hawaii, especially Kauai, is definitely a must in terms of travel, so if you haven’t been there yet, make sure to plan a trip in the future!